Bruschetta began as a poor man’s food – day-old bread would be toasted and rubbed with garlic and olive oil as a snack to keep field workers going through the long days. Although most people associate tomatoes with bruschetta, which is the traditional pairing in Naples, Tuscans use nothing more than garlic and oil. The name bruschetta comes from the word bruscare which translates as 'to toast' and it is an incredibly important part of Italian cuisine. It’s in the record books, too; the people of Spello created the world’s longest bruschetta at 225 metres! As there are so few components to this Italian antipasto it is of the utmost importance to use the best quality olive oil you can lay your hands on, and to ensure the tomatoes are perfectly ripe and at the peak of their season. Try adding different herbs to your bruschetta such as thyme, oregano or chives. You could also add a spoonful of chopped shallot or red onion to the tomato mixture for an extra layer of flavour. You could melt cheese on the bread when grilling for a more substantial morsel – cheddar and Parmesan both work really well. For a meaty option, add slices of cured meat such as Parma ham or salami. 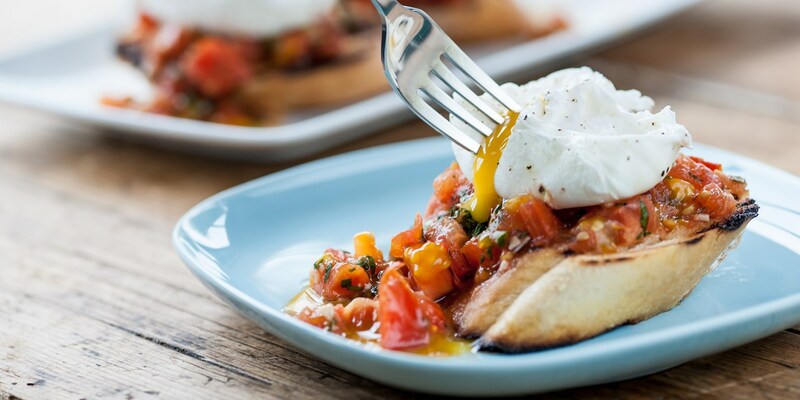 Bruschetta is normally enjoyed at the start of a meal or as a tasty snack, but it makes a great option for brunch; try Marcus Wareing’s Plum tomato bruschetta with poached eggs.